On January 2, 2017 two peculiar meteors (M20170102_001216 and M20170102_015202) were observed by several stations in Switzerland. Both had a long duration, slow velocity, similar brightness and a very similar radiant. As they appeared in a time interval of 100 minutes, a satellite was suspected as a possible origin of these two observations. A closer inspection however showed that this interpretation was incorrect. The two objects were slow meteors. Spectra were taken from both objects, which were nearly identical. Together this points to a common origin of the two meteors. 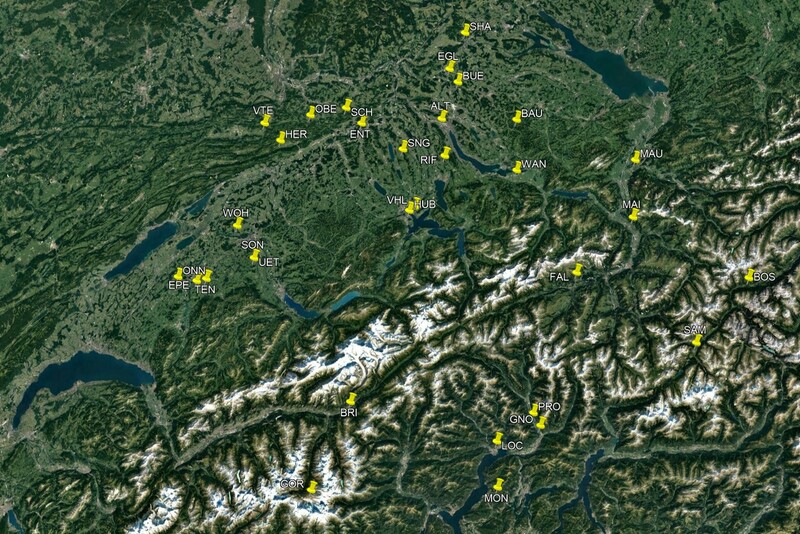 A detailed list of the stations with their coordinates and equipment is given on our website http://www.meteorastronomie.ch/stationen.html. http://www.meteorastronomie.ch/images/Karte_Beobachtungsstationen.jpg. With UFO Orbit the trajectories were calculated (see Figure 1). The velocity v0 was calculated as 12.8 to 13.9 km/sec for the first object, the second object had a v0 of 13.0 to 14.3 km/sec. This is considerably higher than the escape velocity from the Earth, therefore a satellite orbiting the Earth can be definitely excluded. Another view in Google Earth is shown in Figure 2. Further analysis of the radiant and velocities showed a very similar orbit for the two meteoroids. The difference in flight direction is explained by the rotation of the Earth in 100 minutes, the fact that it was observed in almost the same location must be a pure coincidence. Figure 1 – The flight path of the two meteors as observed by the stations of the FMA in Switzerland and Liechtenstein. 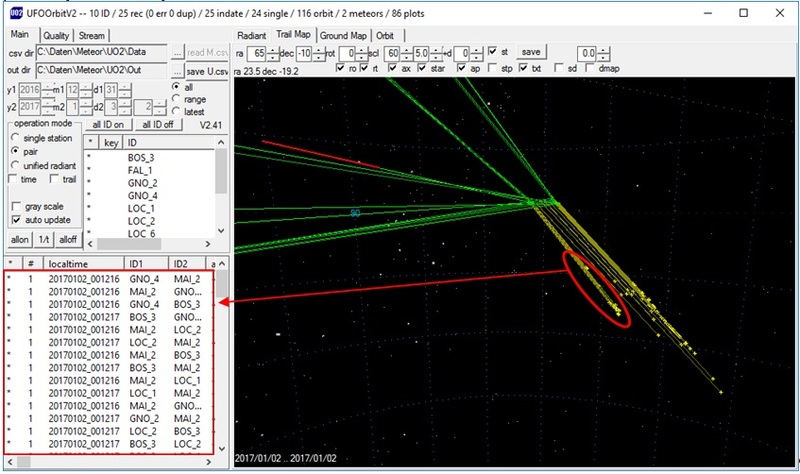 Figure 2 – 3D view of the meteor paths in Google Earth. The different stations combined pairwise gave slightly different radiants, as shown in the following plot (the red circle and rectangle indicate the first meteor). The difference is probably caused by measurement errors. Figure 3 – Radiants of the two meteors. Green: observed great circle trajectories, yellow: correction to radiant for zenith attraction, due to the slow velocity and large zenith distance this correction is very large and variable for the scatter in velocity. Using the unified radiant for the analysis, the difference is easier to spot in Figure 4. Figure 4 – Unified radiant calculated for the two meteors. Again, the left points are from the first meteor, the right points from the second meteor, with the spread caused by the different velocities as observed from the different stations. The orbit calculation for these two objects shows two ellipses with an inclination of 6 degrees to the ecliptic, nearly osculating to the Earth orbit. The measurement data of all the stations have been analyzed in detail by Beat Booz, giving independent results from UFO Orbit for the orbital elements. Figure 5 – Orbits of the two meteors. Peak image, the flight direction is almost exactly parallel to the dispersion direction, zero order recorded for 3.6 sec, first order Na-line overlapping in the peak image. Figure 6 – Spectrum (peak image extracted from video) of M20170102_001216_MAI_2, –1.3m. Again, the meteor flight direction is almost parallel to the dispersion direction, zero order (left, recorded over 5.4 sec) and first order (Na-line, right) are separated. The meteor was visible for 8 sec in zero or first order. Figure 7 – Spectrum (peak image extracted from video) of M20170102_015202_MAI_2, –1.8m. The spectrum was extracted from the video as described in (Dubs and Maeda, 2016, http://www.meteorastronomie.ch/images/20160605_Calibration_of_Meteor_Spectra_Dubs_IMC2016.pdf), where the details of the extraction are described (separation of video into fields, background subtraction, linearization, registering and stacking, wavelength calibration). Additional information on the calibration method can be found in (Dubs and Schlatter, 2015). As the meteor entered from the right, at first only the zero order was visible (see movie http://www.meteorastronomie.ch/intranet/videoarchiv/1221483321922M20170102_015202_MAI_2.MP4). Extracted spectrum from separated video fields, 185 fields added (3.7 sec). Red: first meteor; blue: second meteor, 100 min later (see Figure 8). The meteor train to the right of the zero order peak, with possible fragment (Figure 9). Figure 8 – Full spectrum including zero order of the two meteors. The meteor train shows as asymmetric zero order peak (Meteor moving to the left). Only prominent line: Na I (589 nm), used for calibration, plus weak continuum and train of Na-line. Both meteors showed a nearly identical spectrum. Figure 9 – M20170102_015202_MAI_2.jpg, 170 fields added after background subtraction, linearization and registration. A spectrum with similar equipment (Watec 902 H2 ultimate, f = 8mm, F/1.0, grating 600 L/mm) was recorded by Stefano Sposetti. The spectrum was mirrored and then analyzed with the same procedure as the spectra from MAI. Both spectra show an asymmetric line shape for the zero order and the Na-line caused by the meteor train. Figure 10 – Spectrum recorded at Gnosca. Meteor moving to the left, first order at other side of zero order compared to MAI_2, therefore the meteor train pointing in the other direction with respect to the spectrum. 50 fields added. Figure 11 – Red: spectrum from GNO_6, meteor train at left of zero order and Na-line, fall off at high wavelength caused by the movement of the meteor out of image. Blue: spectrum from MAI for comparison. The third station in Switzerland equipped for spectroscopic observation which became recently active also captured the spectrum, at higher resolution, without zero order. A Sony alpha IIs, equipped with a Canon 24mm, F/1.4 lens and a 600L/mm grating was used. Again the flight direction was almost parallel to the dispersion direction. The prominent Na-line also showed the train to the right of the line. The zero order was outside the image (to the left). In addition to the Na-line several Mg- and Fe-lines can be identified. Figure 12 – Spectrum (106 images linearized, registered and added) from VTE_8. Figure 13 – Wavelength calibrated spectrum with expanded scale (red) to show the weaker metallic lines. Figure 14 – For comparison the spectrum of M20160326_222332 recorded by Jakub Koukal. There seems to be some difference in dispersion in comparison with the spectrum by J. Koukal (2016), (particularly at longer wavelengths). Notice also that our spectra have not been corrected for instrument response. The Swiss meteor network of the FMA (Fachgruppe Meteorastronomie) is fully operational with stations operating video meteor cameras, All-Sky cameras, spectroscopic video cameras, (with radio, infrasound and seismic equipment in addition, which did not record the events presented here). That all three stations equipped with spectrometers recorded one of the two meteors is a happy coincidence, as the view angle of the three cameras is limited and the weather not always good on both sides of the Alps at the same time. The similarity of the spectra and the orbits of the two meteors point to a common origin of the two meteors, which probably are fragments of a larger body which broke apart some short time ago (possible causes are thermal stress when approaching the Sun or collision with another meteoroid). The orbit does not coincide with a known meteor stream which could explain the common origin. The spectra recorded by the three stations are very similar; the main characteristic is the dominance of the Na-line at 589 nm. This can be explained by the low velocity and the resulting low temperature of the ablation process (Borovicka et al., 2008). The differences in the relative intensity of the continuum or unresolved background of other metallic lines compared to the Na-line are in part caused by the different resolution of the spectra. In addition spectra have been recorded from different portions of the flight path, which may explain the remaining differences. The unfortunate coincidence of flight direction and spectrum dispersion and the prominent meteor train reduced the resolution of the spectra. The spectra were recorded at the detection limit, requiring the addition of all the frames in order to get a reasonable S/N. This may have reduced the resolution somewhat. Jonas Schenker presented and collected the data on our website and stimulated us to publish the results. Dubs M. and Maeda K. (2016). “Calibration of Meteor Spectra”. In Roggemans A. and Roggemans P., editors, Proceedings of the International Meteor Conference, Egmond, the Netherlands, 2-5 June 2016. IMO, pages 65–68. Dubs M. and Schlatter P. (2015). “A practical method for the analysis of meteor spectra”. WGN, the Journal of the IMO, 43, 94–101. Borovicka J. Koten P., Spurný P. and Stork R. (2008). “Analysis of a low density meteoroid with enhanced Sodium”. Earth, Moon, and Planets, 102, 485–493.